CBD capsules, tinctures and other products offer alternatives for enjoying the health benefits of hemp. We’re setting the standard for CBD products by producing high quality hemp and CBD products at an affordable price. Pure Hemp Botanicals, a division of Advanced Extraction, LLC, announced additions to their sustainable, plant-based line of health and beauty products. Their new product line includes CBD hemp oil capsules, CBD tinctures, and other high quality CBD products, offering consumers new ways to experience the many health benefits of hemp. Utilizing only local Colorado farmers growing non-GMO, pesticide-free industrial hemp, Pure Hemp Botanicals’ products are made with pure Co2 extracted CBD oil. Cannibidiol (CBD), a chemical compound in hemp, is being studied for its properties to relieve pain, inflammation, anxiety, nausea, and convulsions. Studies name CBD as a possible treatment for more than 20 medical and neurological conditions. Unlike THC, which is found in hemp’s cousin plant, marijuana, CBD is not only non-psychoactive but counteracts the psychoactivity of THC. Pure Hemp Botanicals’ products are made from 100% industrial hemp, organically grown in Colorado. “We’re setting the standard for CBD products by producing high quality hemp and CBD products at an affordable price,” commented Alex Seleznov, CEO of Pure Hemp Botanicals. “We’re proud to further serve our customers through an expanded selection of non-GMO, vegan, and gluten and cruelty free CBD products. For information about Pure Hemp Botanicals’ complete line of products, visit http://purehempbotanicals.com/shop/. 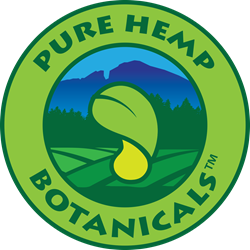 Pure Hemp Botanicals is a division of Advanced Extraction, LLC, operating in Brighton, Colorado. “Compassion in Action” is the mission that guides Pure Hemp Botanicals’ work and relationships. The company serves a growing community of evolving hearts and minds to produce sustainable, plant-based, vegan, and cruelty-free products. The quality goods they craft, manufacture, and distribute are created through ethical, eco-friendly business practices that respect all the earth’s inhabitants. For more information, visit http://www.purehempbotanicals.com.